now reading: What Is the Earliest Evidence for Life on Earth? What Is the Earliest Evidence for Life on Earth? For the first 600 million years of Earth's 4.54 billion-year history, our planet was a hellish place. The rampant volcanism and frequent collisions that wracked our world rendered the surface unforgiving and purportedly inhospitable to life. While water was probably present, the oceans of the time may instead have been rolling seas of magma. The name for this period, the Hadean, is borrowed from Hades, the Greek god of the underworld. The moniker's meaning is obvious: early Earth was a place of death. Yet it was on this comparatively cursed landscape that --against all odds -- life might have emerged. The controversial clue to this incredible notion was made public last fall. Scientists from UCLA showed off apparently biogenic carbon that was locked away inside a near impenetrable crystal for 4.1 billion years. The oldest rocks on Earth don't even date back that far, but peculiar minerals called zircons do. The oldest-known zircons, discovered in the Jack Hills of Western Australia, originally crystalized 4.4 billion years ago! It was within one of these zircons that geochemist Elizabeth Bell and her team discovered the carbon they think was produced by life. Life that old, whatever it was, would not have bones, or even a clearly-defined shape, so a true fossil find will probably never be unearthed. Instead, whatever carbon-based life existed back in the Hadean would simply leave traces of itself in the form of carbon itself. 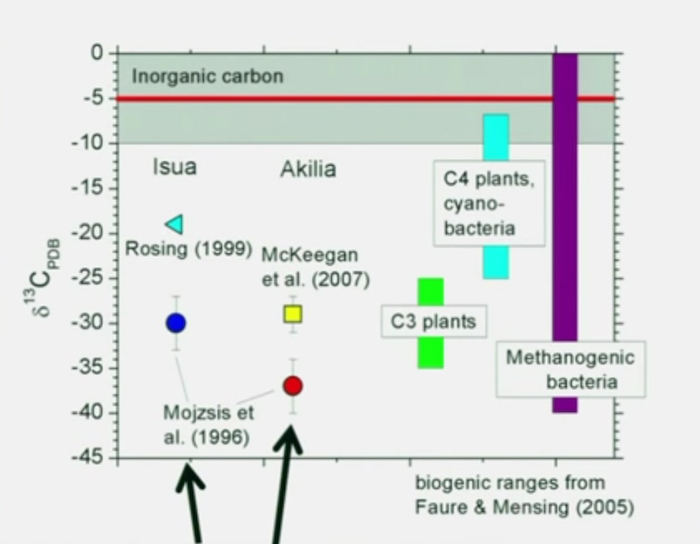 Bell's co-author, Mark Harrison, referred to the stuff as "the gooey remains of biotic life." "The simplest explanation for this is that we had biogenic carbon at or before 4.1 billion years," Bell said in a talk earlier this year at the SETI Institute. The second-most likely explanation, she says, is that the carbon came from the meteorites that supposedly peppered the planet around the same time. Astrobiologists are big fans of Bell's finding. If true, it serves as a testament to the hardiness of life, and fuels hopes that we may find it elsewhere in our very own solar system. Bell and her team have now set about searching for carbon in more ancient zircons from the Jack Hills, raising the possibility that they may find even earlier signs of life on Earth.